Days of Dialogue Targets The Next Generation; The decades-spanning forum recently convened to bring youth together with LAPD to talk about protocol, media, and becoming a police officer. 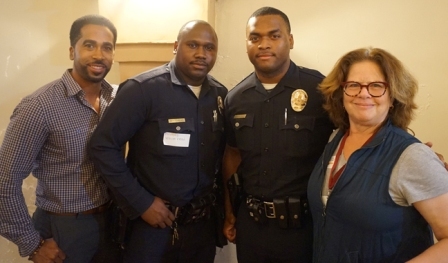 On Monday, April 24, the Los Angeles Police Department (LAPD), Los Angeles County Department of Children and Family Services (DCFS), social workers and youth came together for Days of Dialogue (DOD), on The Future of Policing at Dulan’s on Crenshaw. Foster and homeless youth got a chance to speak with LAPD officers about the use of deadly force, proper protocols, as well as receive insight on the daily life of a police officer. Established in 1995, after the O.J. Simpson verdict, it was evident that people needed to voice their concerns. Then Los Angeles City Councilman Mark Ridley-Thomas, called a meeting of 20 civic leaders and community activists to addresses growing tensions. DOD was Los Angeles' first citywide discussion born out of an innovative nonpartisan initiative. Over two decades later, DOD continues the process of bringing information to the communities by bringing everyone together to talk about current issues. DOD has taken place in political town hall forums in large civic auditoriums, to smaller venues such as neighborhood libraries, churches, and fire stations. Dulan’s restaurant served as the forum for this month’s DOD, complete with food and refreshments. After initial introductions, youth broke into groups, each with a social worker and LAPD officer to fill out a survey and discuss topics ranging from the use of taser guns to joining the police academy. LAPD officers explained their duties as law enforcement and the difficult decisions they have to make in tough situations. After the group sessions ended, the youth were invited to share what they had learned from their group sessions. Many participants gain a better understanding of the pressures police officers face day-to-day, while some learned the role media plays in the portrayal of law enforcement. “I’m thinking of becoming a cop because it sounds pretty interesting,” said one female youth in attendance. Some youth representatives shared their group discussions, mentioning a need for more police of color, especially more women police officers. “Our foot beat unit, Leimert Park Corridor, we did this a year ago and it went really good,” said Lester Bodiford, LAPD Southwest Division. “We really wanted to do it again, I think we managed to do what we set out to do,” he said. “I think events are very important because it gives us an opportunity to dialogue with the youth, let them know what we do on a regular basis and just give them a different outlook on police,” said Marcus Whitehead, LAPD Southwest Division. For more information on Days of Dialogue, please visit www.daysofdialogue.org.